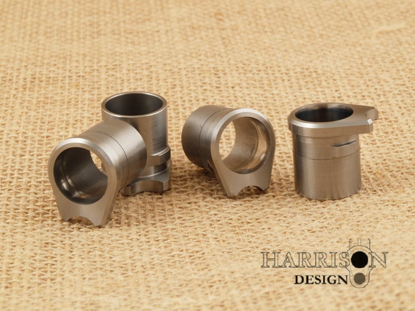 The Bunker Arms Custom Radial Bore barrel bushing is an exclusive design taking the timeless 1911 barrel bushing and enhancing it with today's technologically advanced machining processes. The premise behind this design was to utilize today's technologically advanced machining processes to simplify one of the main challenges faced by custom 1911 builders; achieving a zero tolerance lock-up at the muzzle without any barrel springing. Instead of a traditional straight bore bushing design which requires a wedge style lock-up, the radial bore bushing has a carefully calculated radiused bearing surface to allow full contact with the barrel in any position, and throughout the entire cycle, improving accuracy and reliability. Bunker Arms Radial Bore Barrel Bushing, Blue, .579" I.D. 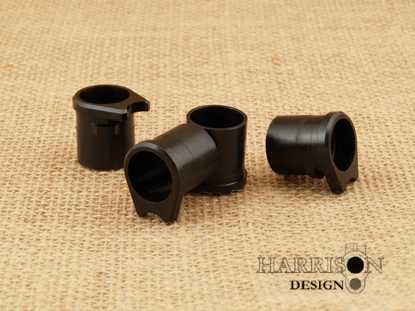 Bunker Arms Radial Bore Barrel Bushing, Blued, .580" I.D. Bunker Arms Radial Bore Barrel Bushing, S/S, .579" I.D. Bunker Arms Radial Bore Barrel Bushing, S/S, .580" I.D.